We are currently recruiting for young musicians who play certain instruments to apply to become members of Britten Sinfonia Academy and for composers to join our Composer Hub for the 2019-20 season. Participants will develop their chamber music skills through a range of exciting ensemble projects and receive expert mentoring from Britten Sinfonia musicians and work alongside key guest artists from our main season. The Academy have performed at the Barbican Centre, Saffron Hall, Latitude Festival, Cambridge’s Fitzwilliam Museum, Jesus College and West Road Concert Hall, Walthamstow Garden Party, and Norwich’s St Andrew’s Hall. In 2019-20, they will work with a range of guest artists including Thomas Gould and Colin Currie. 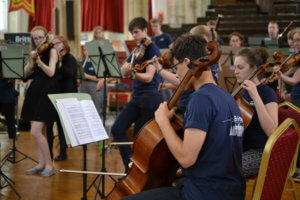 More information about joining Britten Sinfonia Academy here.